A prominent leader of Peru's Shining Path rebel group has been captured, the defence minister has announced. Aurelio Loret de Mola said Jaime Zuniga , also known as "Cirilo" and "Dalton", was seized after clashes with the army. The minister said his capture was a major blow to the rebels in the central region of Ene and Apurimac, where he was second in command. The group, whose leader is in jail, has been blamed for the deaths of 69,000 people between the years 1980 and 2000. The minister said two other rebels were captured and four were killed in the clashes early on Friday near San Bartolome, about 250 kilometres (155 miles) east of the capital, Lima, in a jungle area on the Andes. "Cirilo" suffered a bullet wound in his pelvis, and one Peruvian officer was wounded. Jaime Zuniga is accused of being involved in the kidnapping in June of 71 people working on a gas pipeline in the Peruvian jungle. The Ene and Apurimac valleys, about 500 km (310 miles) south-east of Lima, are considered the last bastion of the rebels - now believed to number a few hundred. 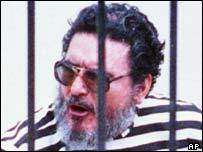 The Shining Path had around 10,000 members until the capture of their founder, Abimael Guzman, in 1992. 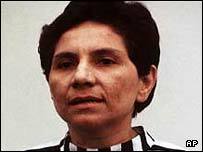 Guzman and his companion and deputy, Elana Iparraguirre, were sentenced in 1992 to life imprisonment in secret trials conducted by hooded military judges. The Peruvian authorities have since ordered that they be retried in a civilian court. After a two-year investigation, Peru's Truth and Reconciliation Commission published its report in August - the result of 17,000 testimonies of people affected by the violence, including jailed rebel leaders. The report says most of the victims of Peru's internal war are believed to have come from indigenous communities, trapped between state troops and rebel insurgents such as the Shining Path. The investigation, in which members of the commission were given unprecedented access to military documents, blamed the start of the violence on Shining Path, a Maoist group, which launched an uprising in 1980. "Analysts... say the movement is only a shadow of its former self"